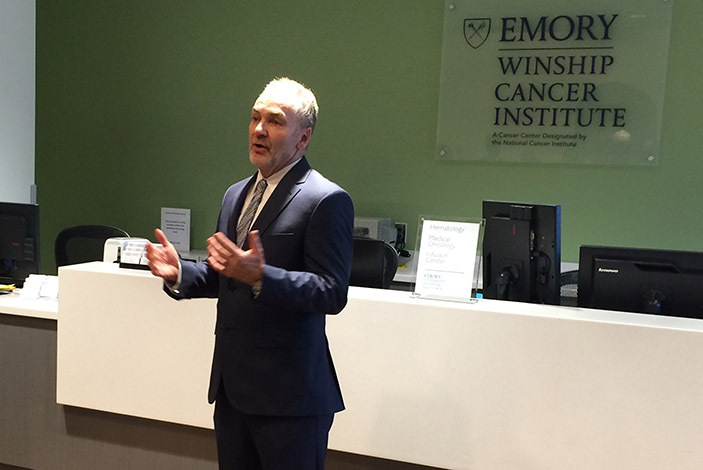 Winship Cancer Institute Executive Director Walter Curran, MD, addresses guests at the Open House. 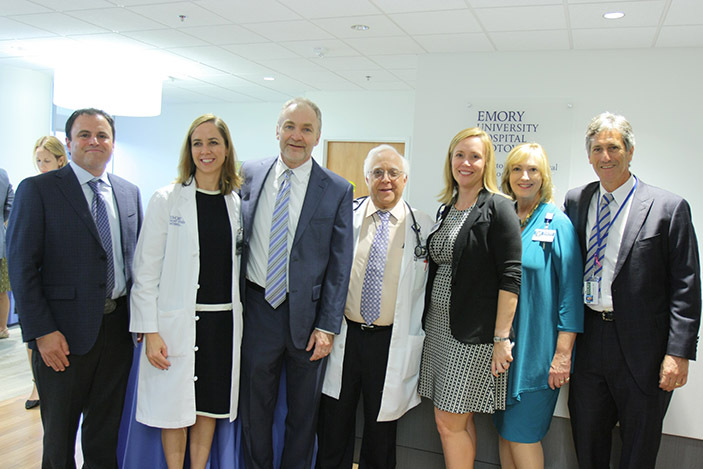 Emory Saint Joseph's Hospital has expanded the Winship Cancer Institute facility on campus, elevating cancer care to a new level. The 28,000-square-foot facility has completed a year-long multimillion dollar redesign and renovation to meet the growing demand for cancer treatment in north Fulton County. 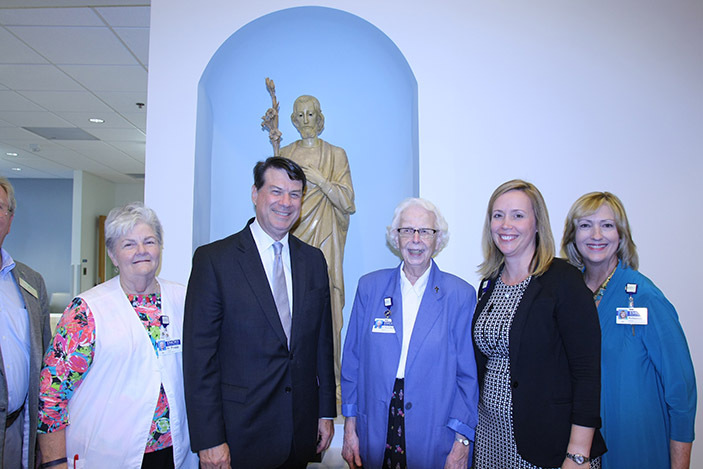 Walter J. Curran, Jr., MD, executive director of Winship Cancer Institute, Sandy Springs Mayor Rusty Paul, and other city leaders were on hand to celebrate the expansion with Emory Saint Joseph's CEO Heather Dexter, staff, and the Sisters of Mercy. As a part of Georgia's first and only National Cancer Institute (NCI)-designated cancer center, Winship at Emory Saint Joseph's treats nearly 400 patients daily. 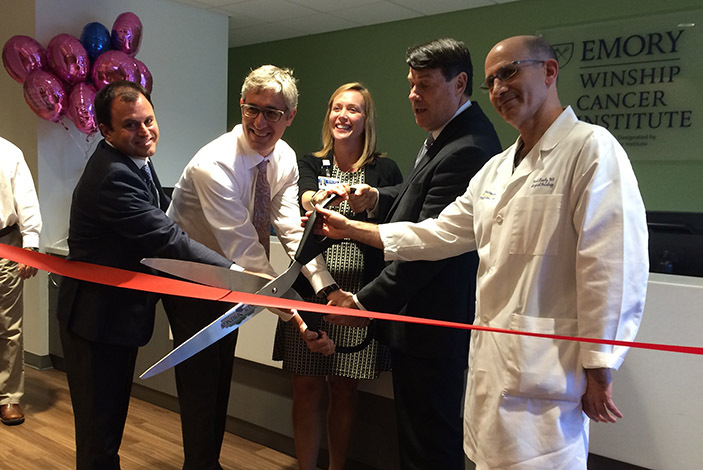 The expansion was designed to enhance the patient care experience while also offering the most advanced technology available for cancer treatment. Two new linear accelerators, used to treat patients with any type of cancer that responds to radiation. This advanced technology can treat patients with many types of cancer with maximum accuracy. Treatment time is also reduced for patients as compared with less advanced accelerators. The Gamma Knife Icon, which offers a minimally invasive and highly precise radiation treatment for patients with brain tumors, neurologic conditions such as severe facial pain or certain vascular malformations. Emory Saint Joseph’s is the fourth facility in the United States and the first hospital in Georgia to acquire this most updated stereotactic radiosurgery technology. Central registration and a lab with seven private areas equipped to access patient venous access ports and to complete lab work before any infusion center, radiation treatment, and/or physician appointments. Ten new treatment areas in the infusion center, increasing the capability of treating up to 28 patients simultaneously. Radiation oncology and medical oncology groups have doubled the number of patient exam rooms, with a capacity of 28. "Our community was in need of additional cancer care, and our goal was to enhance and expand our patient care at Winship," says Heather Dexter, CEO of Emory Saint Joseph's about the facility. "Throughout this multi-phase project during the past year, we continued to provide exceptional care for our patients in radiation oncology, surgical oncology and medical oncology. Patient-centered care is our main focus, and we are pleased to offer so many treatment options and new resources at Winship at Emory Saint Joseph's." In addition to the physical transformation of new treatment areas, clinical space, and technology, Winship at Emory Saint Joseph's patients also have the benefit of receiving cutting edge treatment in their own community with the resources of an NCI-designated cancer center. The community oncology program, led by director Steven Szabo, MD, treats patients with many types of cancer. This comprehensive care also includes valuable patient resources such as a dietician, genetic counselor, and social workers on staff. 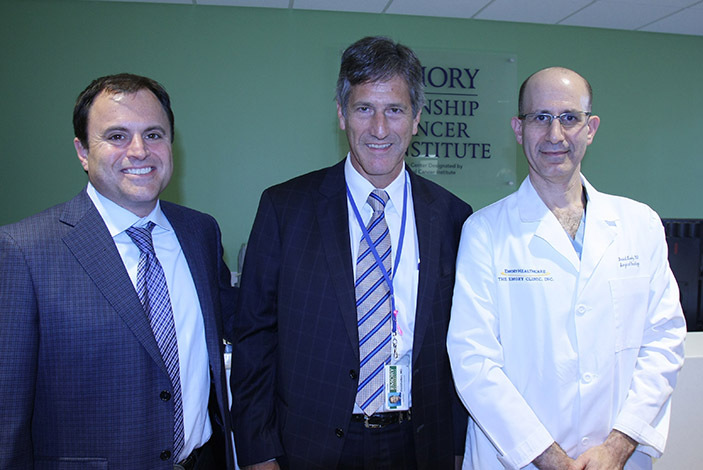 Winship at Emory Saint Joseph's multidisciplinary team also includes Peter Rossi, MD, director of radiation oncology; David Kooby, MD, director of surgical oncology, as well as 25 additional medical oncologists, radiation oncologists, and surgical specialists. "We're serving as an example to the whole nation of how healthcare delivery can be aligned with an NCI-designated cancer center. 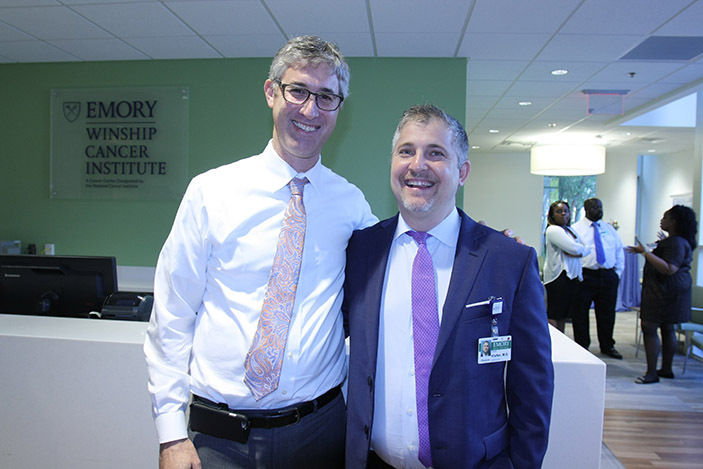 What I want the clinicians, nurses, therapists, dosimetrists, and other staff to feel is that whether they’re working at Emory Saint Joseph's, Emory Midtown, Emory Johns Creek, or Clifton Road, they're really a part of the same team," says Curran. "We're here to support one another in giving the very best care, enlightened by the research that’s being done today, and tomorrow." 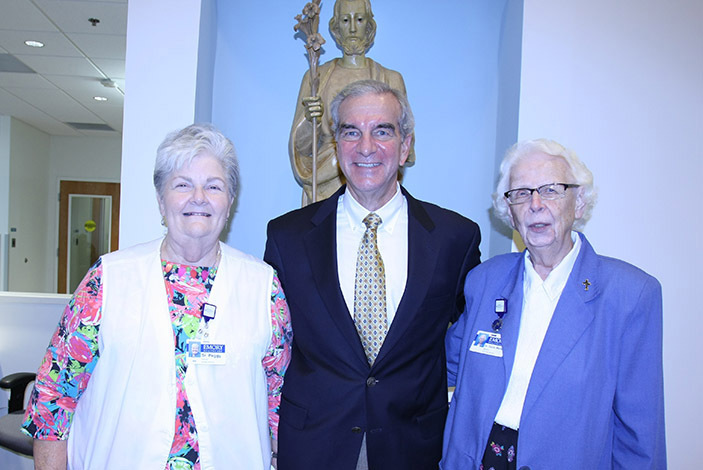 The renovations and expansion of the Winship facility at Emory Saint Joseph's were made possible by a grant from the Robert W. Woodruff Foundation. 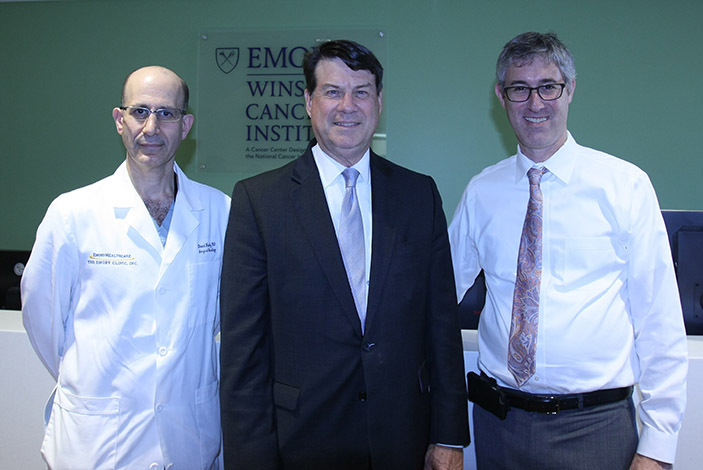 In addition to Emory Saint Joseph's, Winship Cancer Institute is also located on the Emory University Clifton Road campus, Emory Johns Creek Hospital, and Emory University Hospital Midtown.